Home > Shop by Brand > Marine 31 - Waxes, Cleaners & Polishes > FLEX XC3401 Marine 31 Boat Oxidation Removal Kit FREE Bonus! 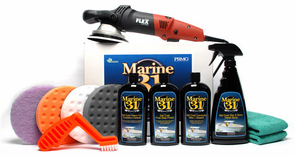 FLEX XC3401 Marine 31 Boat Oxidation Removal Kit FREE Bonus! 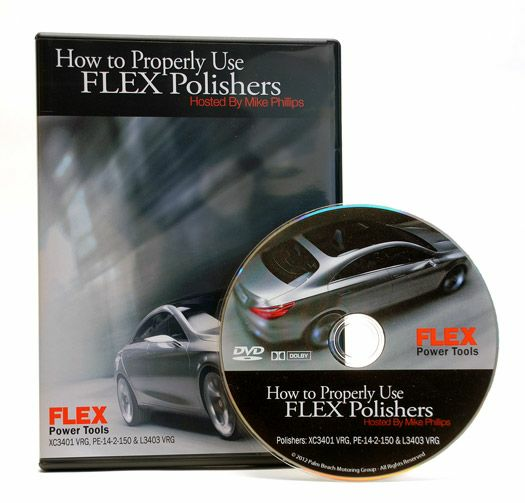 Eliminate oxidation and swirl marks with the power of the FLEX! The FLEX XC3401 Marine 31 Boat Oxidation Removal Kit is the easy-to-use solution for faded, chalky, or oxidized gel coat finishes. The FLEX XC3401's powerful forced rotation dual-action movement will do the work for you! When used with the FLEX XC3401 VRG, the low dusting, easy-to-use Marine 31 polishes quickly cut through dull and chalky finishes, unlocking the brilliant shine underneath. Matched with selected Lake Country CCS Foam Polishing Pads, these polishes are extremely efficient. To protect the shine you have created, the FLEX XC3401 Marine 31 Boat Oxidation Removal Kit includes Marine 31's Carnauba Wax + Sealant and Wax & Shine Detail Spray. These ecologically friendly products will help you keep your boat looking great no matter the seas that lay ahead. Marine 31 Gel Coat Heavy-Cut Oxidation Cleaner is the first step in restoring neglected marine gel coat. Marine 31 Gel Coat Heavy-Cut Oxidation Remover quickly cuts through deep oxidation and removes hull scuffs and scratches from all gel coat surfaces. Proprietary diminishing abrasives work quickly, while Marine 31's advanced lubricant system provides a long buffing cycle and minimal dusting, even in the Florida sun. Use with the included Lake Country Orange CCS Pad to quickly remove oxidation. The Lake Country Foamed Wool 6.5 Inch Polishing and Buffing Pad is the perfect first step solution to heavy oxidation when combined with Marine 31 Gel Coat Heavy-Cut Oxidation Cleaner. Use this to cut through the thickest oxidation and restore a shine to neglected gel coats. A total retail value of $562.88. You save $72.89!